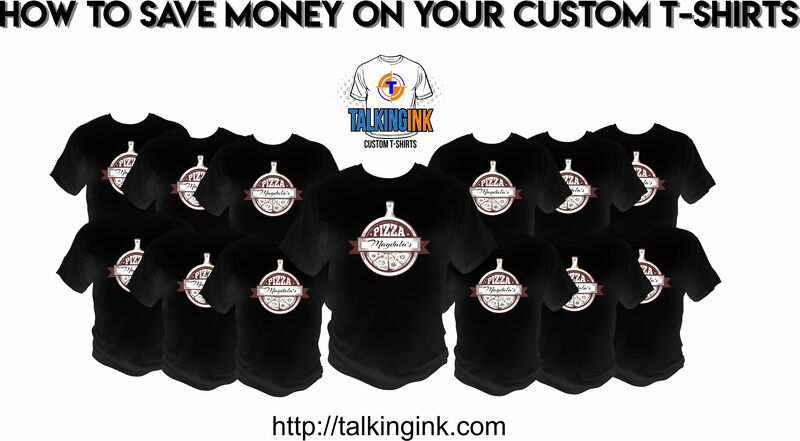 Talkingink custom t-shirts looks to save our customers money wherever we can find it. Sometimes shirts are on sale or we can eliminate some print colors or talk you into a more reasonable solution to save you the cost of inventory. Our goal has always been to give our customers the best product at a fair price. In this post I’ll show you how we are saving some of our customers money. This won’t work for all of you but for those of you who order a few times a year, this post is for you and how you can save money on custom t-shirts. We have a lot of customers in different industries such as restaurants, lawn care, tree care, and small businesses in general. Typically these companies will order short sleeve t-shirts a few times in the spring and summer. Then in the fall they’ll order long sleeve t-shirts and then in the winter they’ll order hoodies. What we encourage our customers to combine those 3 or 4 yearly orders into 2 orders. This way they get a higher volume of shirts which equates to a smaller price per shirt. We show you how to save money on your custom t-shirts. For instance one of customers was ordering 100 t-shirts in the April, another 100 shirts in July, 100 long sleeve shirts in October, and 60 hoodies in December. From a screen printers perspective we are setting up their job on the press 4 times per year. Each order is priced separately based on that orders quantity. So each time they ordered shirts the short sleeve shirts were $8/each. The long sleeve t-shirts were $12/each and the hoodies were $24/each. We met with our customer and encouraged them to look at the savings if they ordered 200 short sleeve shirts in April instead of 100 in April and 100 in July. Then 100 long sleeve shirts and 60 hoodies in October. This way their quantity on each order is doubled, they aren’t ordering any more shirts than they normally do, and Talkingink is setting up the job twice a year instead of four times. This way their price per shirt would now drop because we are printing 200 shirts at time instead of 100 shirts two separte times. Their price per shirt went down to $6/shirt on the short sleeve t-shirts, $10 on the long sleeve t-shirts, and $22 on the hoodies. They went from spending $4200 a year ordering 4 times per year to ordering $3500 a year ordering 2 times per year. A savings of over $700. Needless to say they jumped at this opportunity. It’s an opportunity we encourage all of our customers to look at who order multiple times per year. The savings speaks for themselves. If you are looking how to save money on your custom t-shirts, this is one easy way. To see how Talkinging Custom T-shirts can save you money, give us a call or contact us online through our website. We can look at how you order things currently and see what we can recommend to save you money if possible.